SmartrMail makes it easy to set and forget your brand fonts so you can keep them consistent across all your emails. By making designing emails easy, you'll have more time to automate and personalize your email marketing. 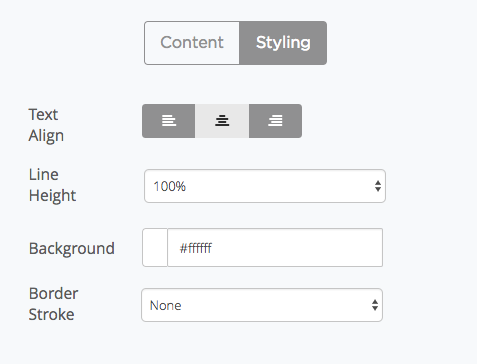 Changing fonts can be done through the Design page. Here you can control the font used, the color, and set a default text size for title and body fonts. To edit your default button font settings. Navigate to the Buttons tab. Here you can edit the button font, font size, and text colour. 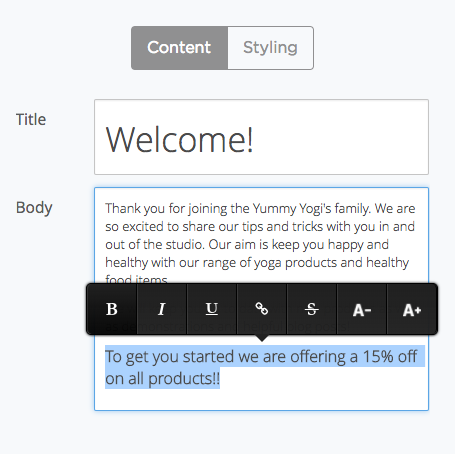 Additional styling tools such as bolding, adding hyperlinks, increasing the text size of a specific phrase can be done directly by highlighting the text you'd like to edit (the editor will appear automatically). The editor should appear on all major browsers. If you don't see it – we recommend using Safari or Chrome. To change the text alignment for an entire text block navigate to the Styling tab within the editor section of your text block. Here you can change left, center and right align your text. In the example below, the text has been centered.